"Mr Mandela has spent 67 years making the world a better place. We're asking you for 67 minutes." 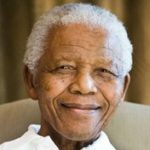 By devoting 67 minutes of your time - one minute for every year of Mandelas public service - on 18 July, you can make a small gesture of solidarity with humanity and a step towards a global movement for good. South Africans joined the rest of the world in celebrating Nelson Mandela's 91st birthday on 18 July 2009, while some people gave 67 minutes of their time to help their communities in support of the global Nelson Mandela Day initiative.